M.K. 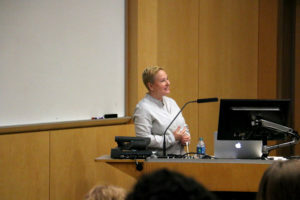 Czerwiec, RN, MA, artist in residence at the Center for Bioethics and Medical Humanities, delivered the event’s keynote speech on the field of graphic medicine. Feinberg’s inaugural Medical Humanities and Bioethics Conference brought together faculty, students, staff and alumni to showcase the wide range of research taking place throughout the medical school, foster conversation around current topics in the field, and celebrate the 10th anniversary of the Master of Arts in Medical Humanities and Bioethics program. The event, held May 5, featured three rounds of research panels of more than a dozen investigators, as well as a keynote lecture, alumni and faculty roundtables and an evening reception. “Our hope is that this becomes a recurring opportunity to gather together and nurture this really vibrant network of scholars and clinicians that are working in this field around Northwestern,” said Megan Crowley-Matoka, PhD, associate professor of Medical Education and of Anthropology in the Weinberg College of Arts and Sciences, and director of the master’s program. The conference began with an overview of the history of the master’s program, led by Tod Chambers, PhD, associate professor of Medical Education and of Medicine in the Division of General Internal Medicine and Geriatrics. Kelly Michelson, MD, MPH, director of the Center for Bioethics and Medical Humanities, welcomed faculty, students and alumni to the conference. The event’s keynote speech, on graphic medicine, was delivered by M.K. Czerwiec, RN, MA, the artist in residence of the Center for Bioethics and Medical Humanities, and a senior fellow of the George Washington School of Nursing Center for Health Policy and Media Engagement. Czerwiec described the evolution of graphic medicine — the interface between comics and healthcare — and explained how comics are currently being employed in the field, from use in public health campaigns to a tool to help patients and healthcare providers reflect on their experiences. 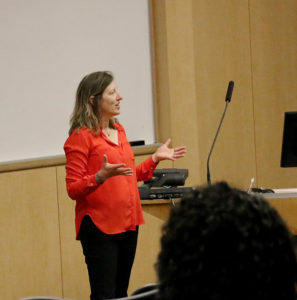 Czerwiec, an alumna of the master’s program, also spoke about her recent book, “Taking Turns: Stories from HIV/AIDS Care Unit 371,” a graphic memoir which chronicles her time as a nurse in a Chicago hospital at the height of the AIDS epidemic. The morning panels featured research on topics ranging from humanism in interventional radiology to crossroads in reproductive technology, and social media use in plastic surgery. 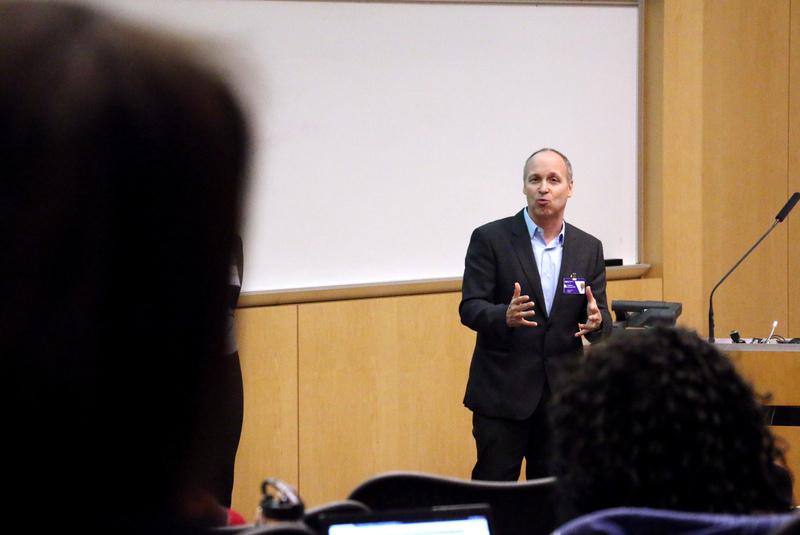 Gregory Brisson, MD, clinical assistant professor of Medicine in the Division of General Internal Medicine and Geriatrics, discussed the ethics around medical students tracking electronic health records of former patients. His research on the topic, which has been published in JAMA Internal Medicine and Academic Medicine, led to the development of formal guidelines in the area. Gregory Brisson, MD, clinical assistant professor of Medicine in the Division of General Internal Medicine and Geriatrics, discussed his research on tracking the electronic health records of former patients for medical education. Along with presentations by other Feinberg faculty — including Kathy Neely, MD, MA, Ethics Committee Chair at Northwestern Memorial Hospital and an associate professor of Medicine in the Division of Hospital Medicine — the panels also featured the research of current medical and master’s students, as well as alumni of the program.